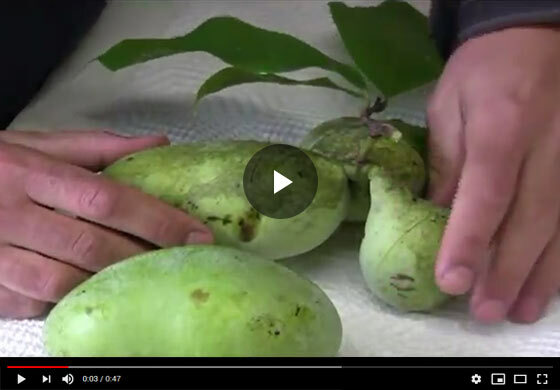 Felix from Gurney's showcases some Pawpaw fruits, all with varied degrees of ripening and discusses their physical attributes and about the care required when picking them. Alright, hello, I'm Felix with Gurney's and we're continuing the fruit harvesting segment. So we talked a little bit about how to pick it and when and what I have here, a number of pieces of fruit and they're of varying degrees of ripeness and they were picked a little differently. So the first one here, you know when you start squeezing the fruit when it's really ripe, you'll leave these indentations because it's getting really peak inside there, again we're talking about a custardy consistent fruit pulp and when its peak you get this give and it's very mushy and, and that's when it's at its best. Again, you look at that, you start thinking about how that'll hold up in a grocery store. If you have to pick these in volumes and transport them, eh, it creates a problem. But as a homeowner, you can pick this when its peak, bring it in and use it right away. Serve it up, extract the pulp and make some recipes with it. This other one is a little less ripe, not quite as soft, but it does have a give. It's got a really nice finish to it. Remember we were talking about the one fruit per cluster. You can see here, we just took a knife and cut the stem off so there's a little bit of stem. That way we're not tearing. Here's an example of a multi clustered piece of, of multi cluster fruit set so again one flower -and we have three fruit set. You can see here even just in bringing it from the tree inside, you can have, you have some tear where the skin's tearing in and it, really this one here is a little riper. You know, even if you cut that here, you're going to have an open site and this isn't a problem if you're going to bring it in and eat it right away. But if you want to keep that for a few days, it's an area for fruit flies to get attached to and and really it's, it's not as desirable as being able to cut a fruit off the stem like we did in that case. Here's another set a fruit. Now we have four per cluster. One already was picked out in the field and had that tearing issue. What I wanna illustrate with this cluster is that there's a varying degree of ripeness. This one here is still pretty firm, the one to this side, it's got yellowing and you can see the indentation, it's softening up nicely. So you do get this variable ripening in a cluster and the best way to deal with that is to pick them one at a time but you have to be very careful how to cut this fruit off and if I was out in the field on the tree and to try to get a knife in there and avoid damaging the other fruit, it's tricky business. But it can be done. But you still have that opening, even in that case, where I've cut it off, there's quite a difference there.